No matter the kind of fishing gear you own, be it fishing boots, fish finders, reels or even rods, always go for the best. Indeed, the market always plays host to countless upgrades. That way, you can always find something that’s not only safer but also highly efficient. Talking about efficiency, our latest run-down of the best ice fishing rods is critical to making sound decisions. Before we unveil our fully-fledged selections, here’s a quick table to provide you with a better idea of what to expect. Indeed, a lot of beautiful, memorable ice fishing experiences can come out of the Shakespeare Ugly Stik USGXICE26L. The rod is endowed with many outstanding features to enhance your ice fishing experience. The manufacturer combines aesthetics, affordability, durability, and functionality features in the model. The rod is Ugly Tech constructed using a combination of graphite and fiberglass, which are durable and lightweight materials. The rod has one-piece stainless steel guides built strongly. In addition, it has a twist lock reel seat for security. The other lovable feature in this rod is that it is easy and comfortable for reeling. The EVA grips are ergonomic, lightweight and durable. Besides that, the tip of the rod is a fiberglass tip, to give the rod sensitivity to fish strikes. The name may be a mouthful for a newcomer in the fishing industry. Once you get used to it, you associate the brand with quality. Piscifun Portable Fishing Rod is a perfect fishing gear for long casting spinning. It is a graphite fishing pole, which is a high performance, high sensitivity, lightweight and portable. The rod’s core is constructed with 24-ton carbon fiber which provides sensitivity to the rod and contributes to its overall performance and durability. In addition, a layer of 8-ton E-glass is added for flexibility and strength. The rod is 6’6’’ in length. It designed as a travel-friendly rod with four detachable pieces. Therefore, it is easy to transport it without damaging it. In addition, it is comfortable to use the rod with its EVA handles. The rod comes with 7+1 high-quality ceramic guides which make line flow smooth and friction-free. The rod’s multi-purpose hook keeper is stainless and ensures no loose hardware. 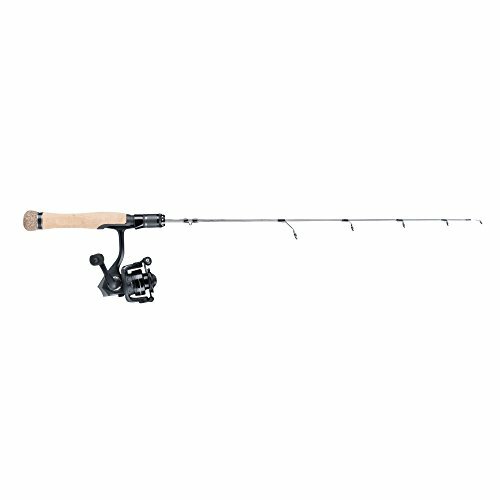 St. Croix Black Legend is a legendary rod manufactured in the United States. They are especially good for open-water fishing but can be used for other types of fishing too. The rod comes with a spring bobber. Its uniqueness lies in its sensitivity levels, sensing even the softest of fish strikes. The sensitivity is attributed to various aspects incorporated into its features. There is a taper in its solid-carbon blank combined with a highly sensitive striker indicator. In addition, the rod has a locking reel seat. The St. Croix Black Legend is a newly released rod for the 2017/2018 Ice Fishing Season. The rod is an improved model from Legend Silver and Legend Gold ice rods. The rod comes in five different sizes namely, light, medium, medium heavy, medium light, and ultralight. St. Croix Mojo Ice Fishing Rod is a great fishing gear for open-water fishing, although some model sizes can do well in ice shelters. The rod is constructed beautifully and uniquely for great performances. The rod comes in about twelve different sizes to choose from. It, therefore, gives you an option to select what suits your ice fishing needs. It has special features that make it stand out from other rods. It has a taper that works with precision. It also has a split-grip Eva cork handle, and a carbon blank, that is solidly built. In addition, it comes with lightweight stainless steel guides. The rod has a solid reel seat too. Eagle Claw Tony Roach is a perfect rod with special aspects to suit fanatics targeting trophy fishes like trout. Eagle Claw Tony Roach is a pocket-friendly and basic rod with various feature combinations of sensitivity and durability. It is good for beginner anglers on a tight budget. It is packaged as a combo with a reel included at a bargain price. The rod is named after Tony Roach because it was designed by Tony Roach, a professional guide/walleye champ. The rod is 28” long with a graphite construction. It has an S-curve. The rod comes attached with a spring bobber for bite sensitivity. In addition, it has durable four stainless steel guides. The rod is designed for ease of use with its rubber cork grips that are comfortable to handle for long ice fishing hours. The rubber cork keeps your hands warm and comfortable. The rod has graphite reel seats. The package includes the rod and a reel. A special fishing equipment built for jigging yet versatile to do other fishing techniques. Made with four main features in mind, performance, durability, ease of use, and special for jigging. The rod is designed with special features to suit vertical jigging. The pole design makes it easier to lure the fish to bite. The rod is a one-piece tubular make. The material is fiberglass and graphite. The fiberglass makes the rod sensitive to the lightest of bites. In addition, the lightweight construction means you can work for extended periods of time without tiring. You will be in a position to present the jigs down deep to the fish and lift the fishes through the ice hole efficiently. The rod is constructed with features to reduce friction from braided line. The rod has 5+1 guides, ceramic inserts, and stainless steel guide frames. It also has an EVA handle and foregrips for comfort during handling. The rod also has an aluminum alloy reel seat to keep the reel in place and a multipurpose hook keeper. Besides that, the rod is strong and can lift heavy fishes. 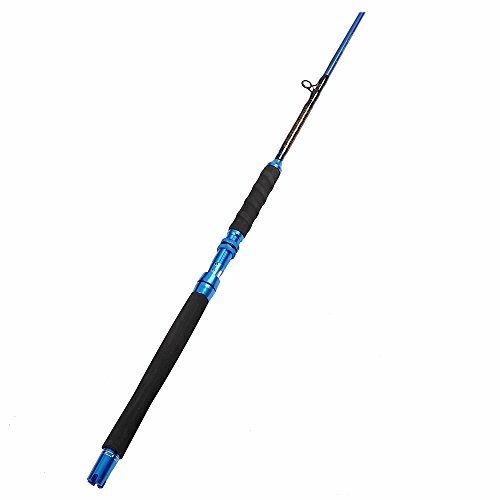 Baitrunner Ultra-Sensitive Noodle Ice Fishing Rod is a uniquely designed fishing rod with a distinctive coloration that makes the rod look customized. The rod has special jigging features and can also handle other kinds of fishing. It is a perfect rod for fishing walleye, panfish, crappie, perch, and trout. The rod is constructed from 28-inch of E-glass. This material makes it an ultra-sensitive fishing rod. It also comes fitted with a strong backbone, so that you can set your hooks securely. Its other uniqueness is that a removable tackle/bait cup is built in the handle. This makes bait easily accessible and conveniently stored. In addition, the ABS handle is designed for maximum sensitivity in addition to being self-centering to position the reel well. Compared to the price of other rods, its price is in the middle range. Sensitive, ABS handle and E-glass material. BaitRunner Medium Light is a fishing gear with an innovative design for aesthetics, convenience, performance, affordability, and comfort. 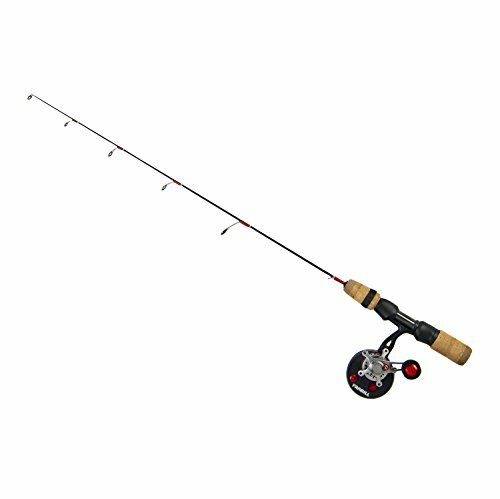 The rod works great as both a dead stick rod and open-water rod and is ideal for fishing perch, crappie, trout, walleye, and other fish species. It has a special color design to pass for a high-end, custom-made ice fishing rod. The 28” rod is designed to be very sensitive. Its hook sets are secured with a strong backbone. The cord handle is easy to use and can be operated for long hours. The cork handle also has a removable built-inbuilt-in bait cup for storing jigs, tackle, and baits. This offers convenience to any angler. The bait cut is designed with an O-ring seal for safe storage of the contents. 371Frabill is equipped with many functional aspects for an ultimate ice fishing expedition, including comfort, sensitivity, and durability. It has titanium main guides. Therefore the guides are lightweight and durable. Constructed with eyelets for a smooth draw they can’t crack in the ice. The rod is designed with a cork handle and a graphite reel seat. 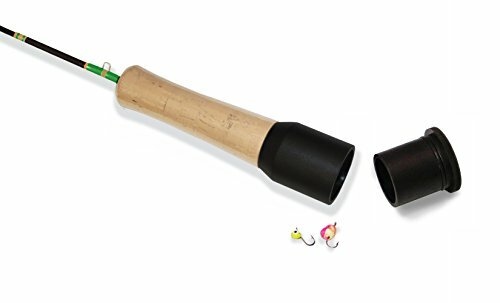 The rod handle is constructed to be comfortable and to make it easier for you to be sensitive to fish bites. The combo, on the other hand, includes a reel. The reel has a ball bearing of 5+1, assuring you of a smooth retrieval. The reel also has ultra fine free spooling features with a gear ratio of 3.7:1. On top of that, the reel has a super smooth drag and instant Anti-Reverse features. 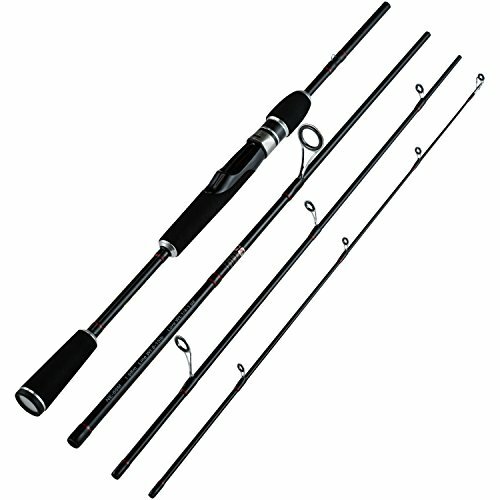 The combo comes at a medium price range compared to other rods. A package includes the 371Frabill rod and an ultra-performance reel. Abu Garcia-Venerate is an ice fishing gear with special features for spinning fish. The features include durability, comfort, performance, and affordability. The rod has a solid carbon blank, with steel guides that are stainless steel and are therefore corrosion resistant and have Zirconium inserts. The graphite material in the rod blank makes it lightweight and durable. The rod handle material is cork. The cork combined with the rod blank features, make the rod comfortable to handle for extended periods of time without experiencing hand fatigue. The reel, on the other hand, has a 3+1 bearing system, extended reel stem, and low-temperature gear lube. The package comes as a combo offer with four sizes to choose from. The sizes are Ultra Light, Light, Medium Light, and Medium. The four sizes have slightly different features and different prices. You choose the size depending on your fishing needs. The rod handle is cork, and therefore comfortable to hold in cold temperatures. Having read this entire review, you might be wondering which rod of the 10 reviewed is truly the best. Well, much as it’s a challenging task, we’d like to make it easier for you. These are the crucial pointers to always keep in mind. Ice fishing rods are normally put through torturous use. For that reason, it would be ideal to go for one made from the toughest materials. The two materials we recommend are graphite and fiberglass. There are four categories of rod power categories namely heavy, medium, light, and ultra-light. The kind of power you settle for should be dictated by your preferred fishing style. If you're targeting big fish species, such as pike and trout, go for a heavy action rod. However, if dealing with small species ranging from 2 to 3 pounds an ultra-light rod would suffice. If you can manage to find something that has an excellent base material and the kind of power that suits your style, go for it. The Shakespeare Ugly Stik USGXICE26L is the undisputable favorite rod for cold season fishing. It’s a light action rod which is designed with a fiberglass tip. This makes it incredibly sensitive to nibblers and also pretty long-lasting. Its EVA handle and one-piece stainless steel guides make it a boon for different styles of fishing. 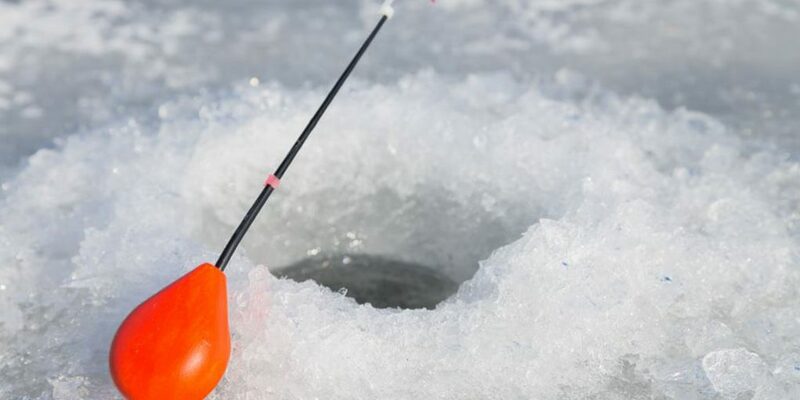 So, there you have it – our full list of the most sought-after ice fishing rods. Of course, none of them is perfect. But if you look closer, you can always find one that meets and exceeds your expectations.